Two of East Africa’s most wanted wildlife criminals have been arrested in Malawi for their involvement in the illegal trade of ivory. 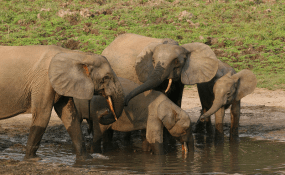 Brothers Chancy and Patrick Kaunda of Malawi, who were the subjects of Interpol Red Notices issued at the request of Tanzania, are suspected of trying to export 781 elephant tusks from Tanzania to Malawi without the proper permits in 2013. The illicit tusks are valued at $5.8m (R79.9m), and had been concealed in a shipment of bags of cement. According to a statement by Interpol, the Malawi police, in cooperation with Tanzanian authorities and supported by a team deployed by Interpol, apprehended one of the fugitives in northern Malawi on Wednesday, October 4. Based on information following the arrest, police were able to locate and apprehend the second brother just a few hours later. The arrests took place within the framework of Operation Usalama IV, an operation led by the Eastern Africa Police Chiefs Cooperation Organisation (EAPCCO) and the Southern African Regional Police Chiefs Cooperation Organisation (SARPCCO) with support from Interpol. The two-day operation targeted transnational crimes including human, drug and arms trafficking, people smuggling, terrorism, counterfeit and illicit goods and environmental crime. “These arrests demonstrate the commitment of Malawi and Tanzania to combating the organised crime networks active in environmental crime through an intelligence-led law enforcement approach,” said Henri Fournel, Coordinator of Inetrpol’s Project Wisdom. “We congratulate our colleagues for apprehending these fugitives, and commend all our member countries in Africa and Asia for their continued dedication in the fight against international ivory trafficking,” said Fournel. Fournel said the arrests highlighted the importance of ongoing cooperation between Interpol’s Project Wisdom and local authorities to tackle the illegal trafficking of ivory and rhinoceros horns in Africa. Funded by The Wildcat Foundation, Project Wisdom encourages Interpol’s 192-member countries to prioritise international exchange of information and to expand their use of Interpol policing capability, including its colour-coded notices system to investigate, locate and apprehend environmental criminals.